Aviation: From Curiosity To Reality explores the development of aviation from da Vinci, Samuel Langley, the Wright brothers, and William Christmas (the third American to fly) and others. Man has dreamed of flying for hundreds of years. The artist da Vinci drew a flying machine in 1490; in 1889, R.J. Spalding patented a bird suit to help him fly; and in 1906, Traian Vuia built an “aeroplane automobile” that hopped. Learn about early aviators including the Wright brothers, William Christmas and Bessie Coleman, etc. Read about the thrill of flying with barnstormers, wing walkers, Charles Lindbergh and the New York City Air Police. Aviation: From Curiosity To Reality has 80 illustrations, experiments for the reader to conduct, a time line of firsts in aviation, and patent applications. An interest in Dr. William Christmas, aviation pioneer, led to her first book, "A Christmas Flight: Aviation Pioneer Dr. William Christmas". Ever the teacher, Mrs. Lipsey decided to expand her research into a book on aviation history for young people. Her new book is well documented and illustrated and, while still centered on Dr. Christmas, shows how he fit into the history of aviation. With a connection to Fairfax Station and the mid-Atlantic area, it is a good starting point to learn more about the early days of aviation. I particularly enjoyed the graphics, which are crisp and sharp and highlight the text. Two comparison charts, "Aircraft Designed by Professor Samuel Langley, the Wright Brothers, and Dr. William Christmas" and "Christmas's 1938 Battle Airplane Compared to the 2015 US Air Force Stratofortress" help the reader to see how his ideas compared to those of other pioneers. 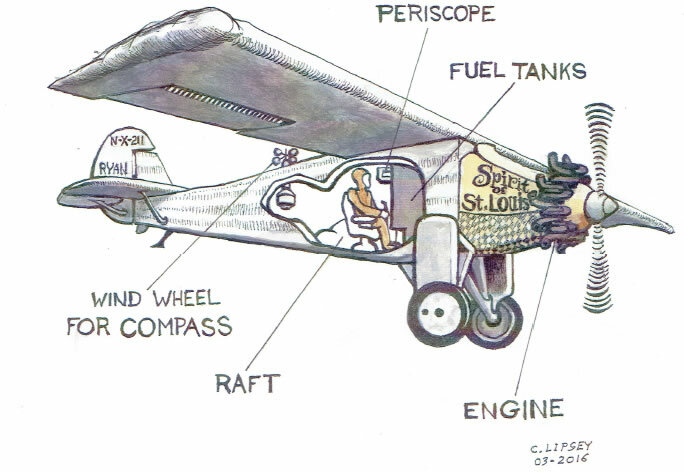 Sketches of several lesser known aviators, including women, information on design, engineering, barnstormers, and expanded uses of aircraft up through drones, should interest young scientists and encourage them to learn more about flying. What boy or girl doesn't dream of flying, gazing down on the earth from the cockpit controls of an airplane or space capsule? 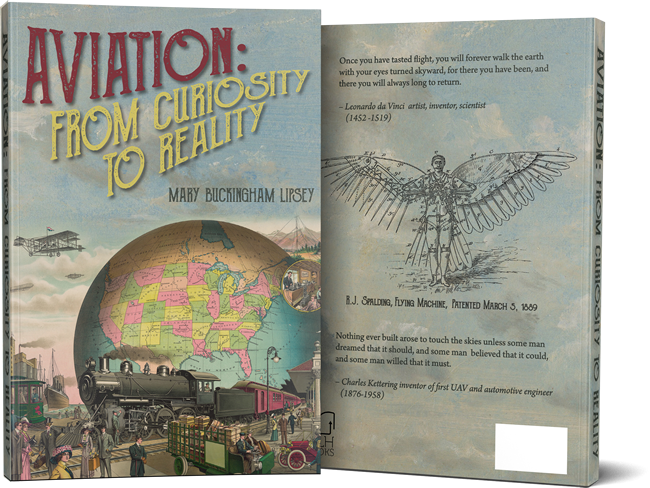 Inspired by America's early space program, retired history school teacher Mary Lipsey explains the principles of flight in her book Aviation: From Curiosity To Reality. Learn how early pioneers of aviation studied birds and experimented with new technologies as they competed to be the first to fly. Then in 1903, a few days after Samuel Langley failed to lift off, Orville Wright flew 120 feet and modern aviation was born. Mary Lipsey recounts inspiring feats of the pioneer inventors and daring first aviators, and suggests guides for readers eager to learn more about aviation. Mary Buckingham Lipsey was born in Atlanta, Georgia and raised in Fairfax County, Virginia. She received a B.A. in History and Sociology from Mary Washington College and a Masters in Middle School Education from Virginia Tech. In June 2003, Mary retired after teaching seventh grade American History for almost thirty years. Mary has been a volunteer docent for the American History Museum of the Smithsonian since 1980 and for the National Archives since 2004. She is a member of the Fairfax County History Commission. Her interest in local history has found an outlet through writing articles and speaking to community groups. She became interested in aviation when her elementary school teacher wheeled a television into the classroom to watch astronaut Alan Shephard’s first flight. Are you interested in selling the book? Would you like to request a Bulk Order? We'd love to chat! Please complete the form below and we'll contact you as soon as possible.